SOUNZ has signed a Mahi Tahi agreement to work together with Te Taura Whiri i te Reo Māori (Māori Language Commission) at a hui whakanui (celebration) held at the SOUNZ offices on Monday 11 March. The agreement was signed by Diana Marsh, SOUNZ Executive Director, and Ngahiwi Apanui, Tumuaki (CEO) of Te Taura Whiri i te reo Māori. With the signing of the Mahi Tahi agreement, SOUNZ commits to use and promote the use of te Reo Māori across the organisation’s work and operations, and Te Taura Whiri i te reo Māori agrees to provide ongoing support to achieve this. The works to be recorded and filmed later this year have been announced. was selected along with Joshua Taylor's willy wonka dekor. Learn more about past Westlake Symphony Orchestra Recordings. The aim of the project is to encourage composers at all career stages to have high quality works available for non-professional orchestras. Check out the trailer for the forthcoming Rainbow Rosalind meets the Orchestra films that we will publish just in time for school holidays. 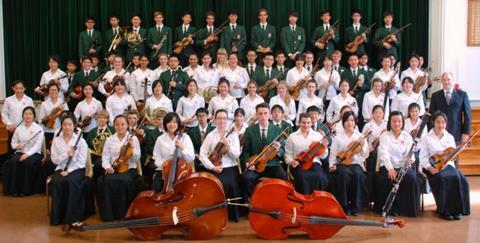 This SOUNZ Community Commission was performed by the Dunedin Youth Orchestra conducted by Anthony Ritchie. Resound presents films of NZ music in concert. Made with the support of NZ On Air, audio is provided by our Resound partner RNZ Concert. SOUNZ education resource for NCEA levels 1, 2 and 3, featuring Claire Cowan's Subtle Dances is now available. Visit SOUNZ Online to learn more. Subtle Dances is a set of three short moods for piano trio, each featuring one instrument more prominently – firstly cello, then piano, then violin. Did you know NZTrio runs a NZTrio Live! programme for High Schools? NZTrio also welcomes the opportunity to explore masterclass and/or performance opportunities around Subtle Dances at schools. Choral Connect 2019 takes place 10-13 July 2019 at St Mark’s Church School in Wellington. Registrations are now open and find a list of presenters here. Earlybird registrations are now open for the World Symposium on Choral Music 2020 in Auckland, until 31 July. Creative New Zealand funding available. Check out the latest items added to our collection. More featured items in our SHOP. Are you involved in presenting NZ music? Did you know you can now submit events to our website listings? If you are taking part in an event which includes NZ music, click here and let us know about it. As a Friend of SOUNZ your membership payment and donations will help us champion New Zealand music. Receive ticket discounts to concerts presented by our partner organisations, get 10% off purchases of SOUNZ products and get invited to our events organised in 2019. You received this email because you've signed up to receive communications from SOUNZ.